Pajama Club believes that every child, no matter their circumstances, has the inherent right to a loving good night, complete with the comforting bedtime routine of changing into clean, warm pajamas and enjoying an entertaining story. Our Mission is to support the completion of 24-hour good day loop for all children and to bring Love and Hope, especially to those who need us the most. Pajama Club offers at-risk children the unconditional gifts of new pajamas and a new book four times a year, each season — ordinary objects that transform their bedtimes into comforting love, support and fun. The Children can enjoy the greatest benefit of a loving bedtime and peaceful good night and a peaceful good day. We want every child to feel the love and security that ensures peaceful sleep — and to awaken with the energy and to make every day positive, happy and hopeful. Love is the Best Light to Read In! 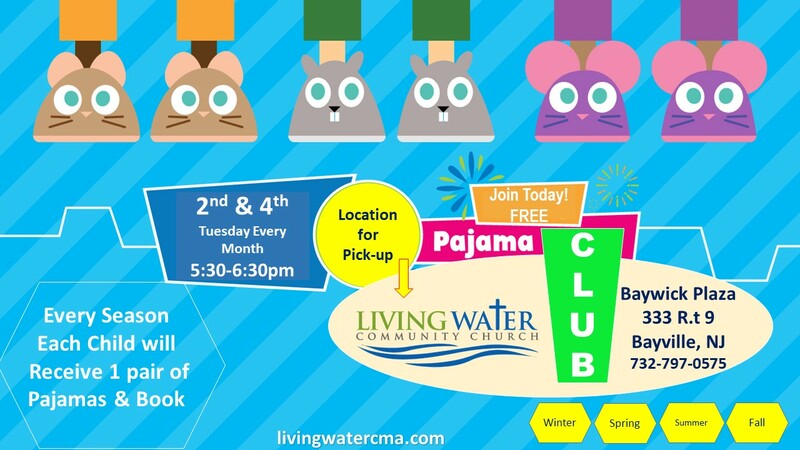 Pick up is the 2nd & 4th Tuesday of every month at Living Water Community Church- Walk -In, No appointment needed. Call 732-797-0575 for any questions.